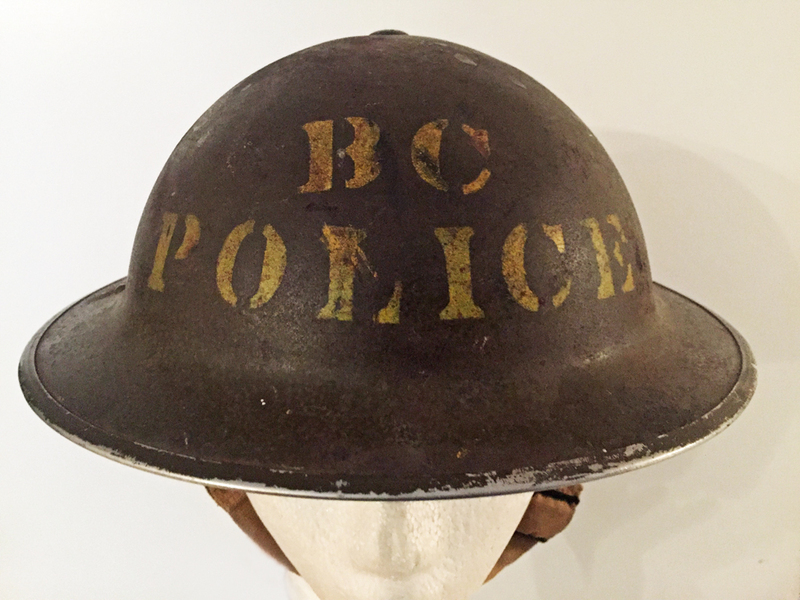 The British Columbia Provincial Police (abbreviated BCPP or BCP) were formed in 1858 and were in effect tied with the Texas Rangers for being the oldest territorial police force in North America. There was a long-standing friendly dispute as to which force was actually older as there was a 2-week period of confusion in 1858. The BCPP were a very well trained and advanced technology force. They were possibly the first police force in Canada to have an aircraft. They had radios installed in cars very early. They also had a fleet of small vessels for patrolling the West Coast. 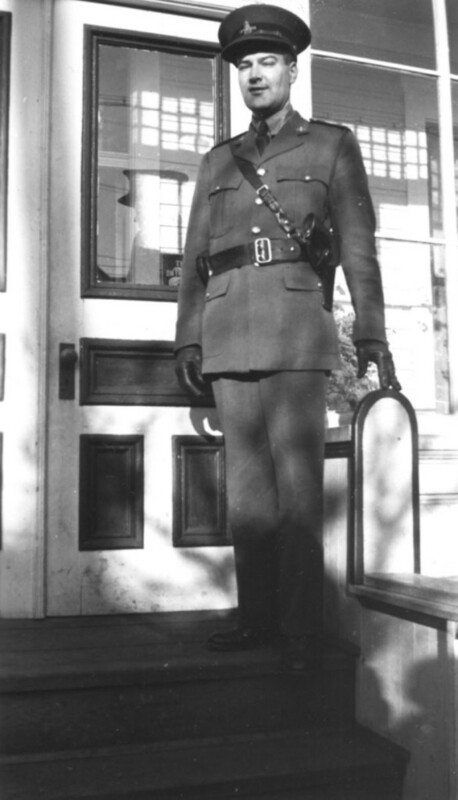 In 1950 the Attorney General of British Columbia concluded a secret deal to disband the BCPP and hand over their duties to the Royal Canadian Mounted Police. The BCPP published a quarterly journal called THE SHOULDER STRAP. Interestingly, the RCMP in B.C. continued to publish the SHOULDER STRAP until 1967. I now have a complete set. I have a Nominal Roll of the members of the BCPP. It is not complete but it is the most complete one that I know of. I used the Nominal Roll that Eric Hallum, the last President of the BC Police Veterans had assembled. I have merged it with other shorter lists and some of the information gleaned from the veterans themselves, from THE SHOULDER STRAP and from history books. Regimental Numbers were not issued until after World War I (so I believe) and many entries are eith initials only. Many brothers and ftather/son pairs served so it is condusing at times. As we’ll, there was a policy for a few years after World War II that if a man left the BCPP, e.g. to join the military during the war, and then rejoined, he was assigned a new number. There is a prestige in having a lower number as it shows you are “an old hand”. This policy was reversed about 1947 I think. The result is that some men have up to three different Regimental Numbers. When the BCPP were disbanded in 1950, it was a very sad day. There was no ceremony thanking the BCPP. Constable Don Brown went out on patrol as a BCP member and at midnight, the Cinderella Effect, he magically changed into an RCMP member. He still wore the same BCPP uniform as it took time for the RCMP to issue new uniforms and other kit. My late father-in-law, Theodore BRUE was BCCP # 873 from 1941-06-19 to 1950-08-15 and RCMP # 16419 from 1950-08-15 to 1970-03-06. 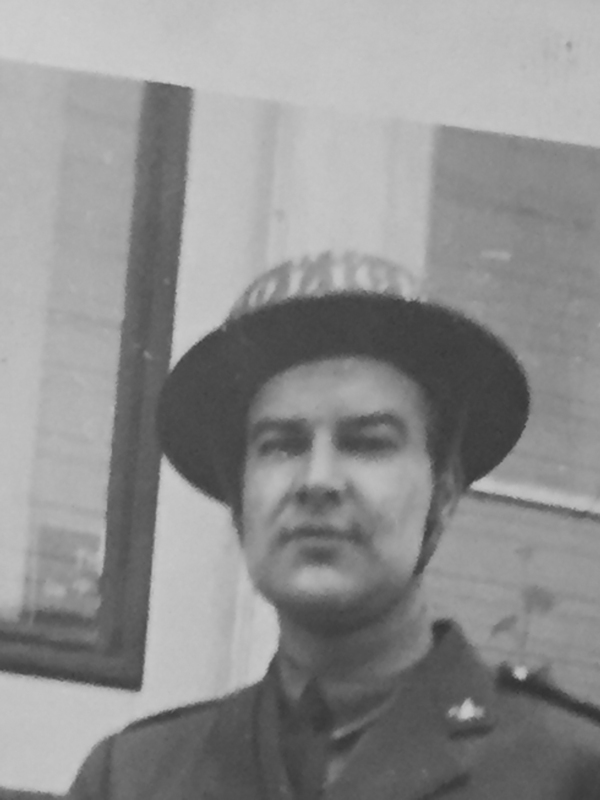 Ted BRUE BCPP circa 1942 wearing his issued BC POLICE steel helmet. This is probably not the one shown in the photo above as that helmet was purchased from a Vancouver Island dealer.